When Miami University student and Art History major, Caroline Bastian, arrived in Washington D.C. for her prestigious and competitive Curatorial Internship at the Smithsonian National Museum of African Art, she had no choice but to immerse herself in the local culture. Her first day coincided with the Washington Capitals' Stanley Cup parade, and the summer interns were required to attend the celebrations after orientation. Her first day was the perfect introduction to the exciting and fulfilling summer ahead. 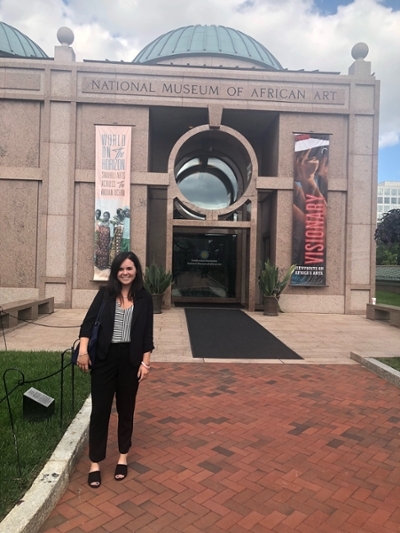 The internship consisted of research for the Curatorial Department at the National Museum of African Art. The department oversees research, organizes exhibitions, responds to public inquiries, and makes recommendations concerning museum acquisitions. Interns work directly with curators on specific research topics related to objects and future exhibitions. People often turn to the Smithsonian to donate or sell art they have collected or acquired, but traditionally these collections are minimally published or researched. Though it was challenging, Bastian was able to quickly establish identifying characteristics of numerous styles found throughout continental Africa and apply it to her work. She also spent a significant amount of time researching the current collection to find reference pieces for future acquisitions. This multi-layered approach to research allowed her to gain valuable new insights into the rich history of African art. Bastian felt that a major highlight of her summer was the ability to work closely with the incredible scholar and teacher, Dr. Christine Kreamer. She also credits her education and experience at Miami for helping her secure this once in a lifetime opportunity. "I do not think I would have been considered for this internship had it not been for Dr. Jordan Fenton’s guidance and support, as well as my internship experiences at the Miami University Art Museum" she continued, "Both have shaped my education so much while I have been at Miami and I cannot thank them enough."